Behind him, beside him, before him, the synchronized cathedral bells began to ring out. One, two, three . . .
She caught her prince once. Can she catch him again? American heiress Corina Del Rey’s life was devastated by war. Every thing she loved was lost. But after five years of grief, she’s shed her grave clothes and started over in the sunshine along the Florida coast. But some things are not so easily forgotten. When a secret from her past confronts her face to face, she realizes she must follow her heart. Even if it cost her everything. Prince Stephen of Brighton Kingdom is a former Royal Air Command lieutenant turned star rugby player, trying to make sense of his life after the devastation of war. When his brother, King Nathaniel, discovers Stephen’s pre-war secret, he must deal with an aspect of his life he longed to forget. But how can he do so without exposing the truth and breaching national security? Yet, true love has a destiny all it’s own. As the cathedral bells peal through Cathedral City, Corina and Stephen must chose to answer the call of love on their hearts. Or let it be lost forever? Everyone needs a good princess story once in awhile right? 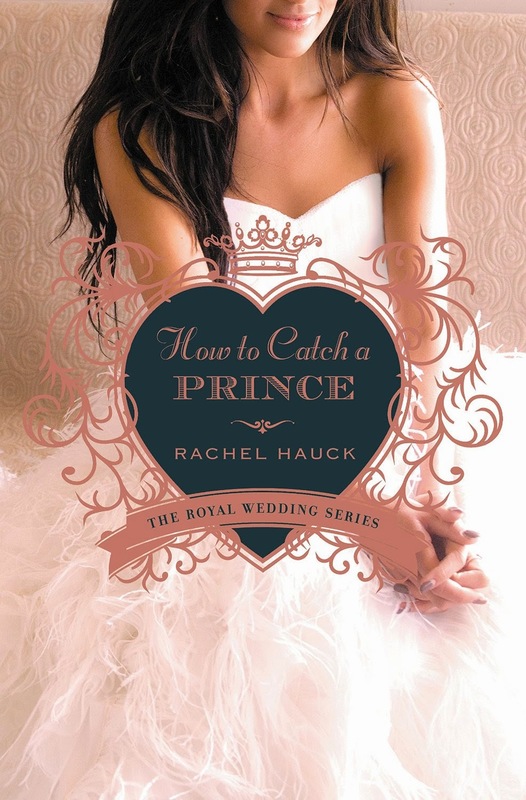 Rachel does not disappoint in this story of a princess trying to find herself after a devastating loss. I love how she doesn't shy away from real life, yet brings hope through her story. There are a few twists in this book that I absolutely loved, but I won't spoil them for you. It's fun to imagine what it would be like to live as royalty. This series is a bit like The Princess Diaries, but with grown women instead of teenagers, and a lot more to the characters. This is the third in the Royal Wedding Series, set on the present day, but imaginary isle of Brighton in the North Sea. I've read all three (and highly recommend them! ), but I think this one would stand alone fairly well. PS. I've read about 6 of Rachel's novels now and they are all good! I need to get caught up on the rest! How to Catch a Prince releases on February 24th, but you can pre-order a copy and get the first 3 chapters to download now, plus a special short story about King Stephen I and his love (featured in this book). Just enter your information on this page. 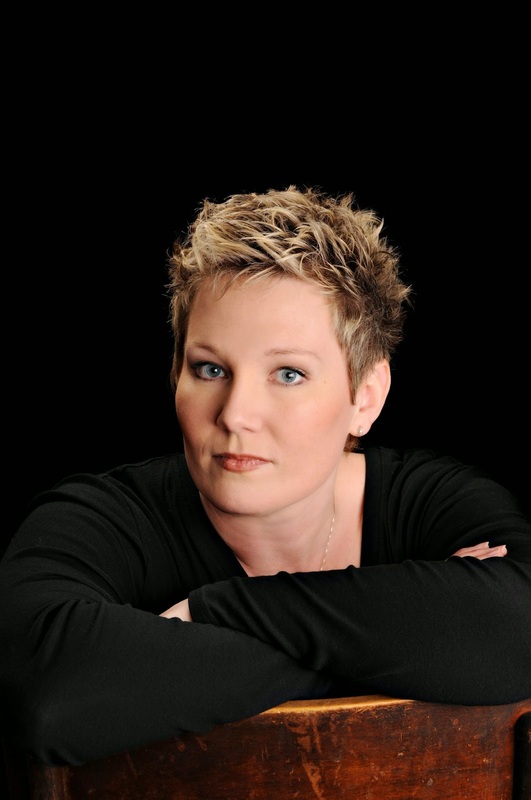 Rachel Hauck is an award-winning, best selling author of critically acclaimed novels such as The Wedding Dress, Love Starts with Elle, and Once Upon A Prince. She also penned the Songbird Novels with multi-platinum recording artist, Sara Evans. Booklist named their novel, Softly and Tenderly, one of 2011 Top Ten Inspirationals. You can keep up with her on Facebook, I love interacting with my favorite authors! Rachel sent me an advance copy of this book to read for myself, all opinions posted are my own. For those of you who aren't on Facebook (hi Wendy!) but check the blog religiously, yes, this week has not gone according to plan. 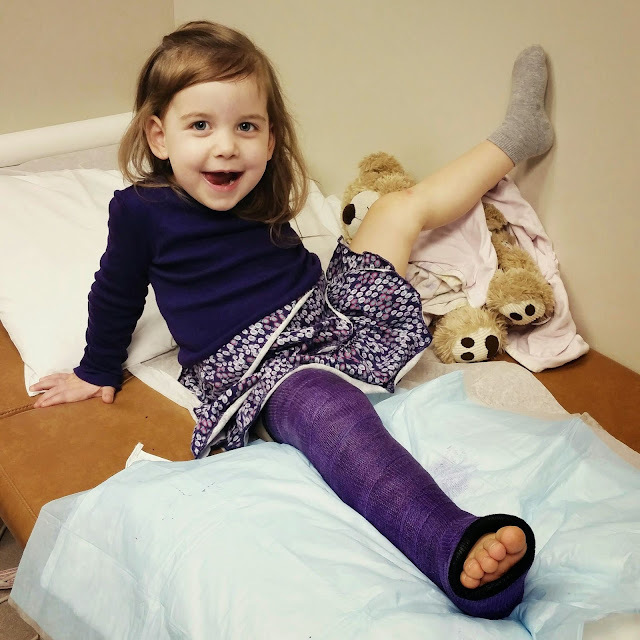 Sunday afternoon at a birthday party at a local gymnastics place my little one was just trying to stay out of her big brother's way and fell off the side of a trampoline. 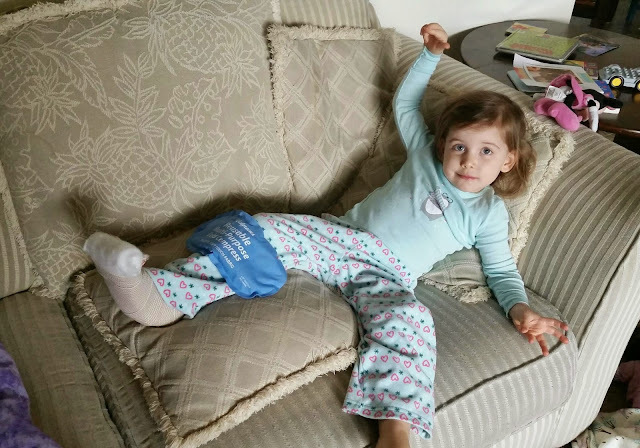 I'm sure it sounds much worse than it was, she jumps off things that high at home all the time, it's just this was a fall and she wasn't ready for it. Hairline fracture just below the knee, but not in the growth plate at all. So today she got to pick a pretty purple cast (which she will have for the next 6 weeks) and here we go. Thea James has accepted an assignment as co-chairperson for Larkindale’s first quilt show extravaganza. Juggling the new assignment with running her antique business, she’s already feeling frayed when things start to unravel. Mary-Alice Wentworth, a much-loved town matriarch, respected quilt judge, and Thea’s dear friend, is covertly conked on the head during the kick-off Quilt Show Soiree, throwing suspicion on her guests. It also appears that a valuable diamond brooch has been stolen during the attack. The family is furious. But is it because of their mugged mother or the missing diamonds? When a renowned textile expert goes MIA and the famous Wentworth heritage quilt disappears, Larkindale’s reputation as a tourist haven is at risk. Thea attempts to piece the mystery together and save the town’s investment in the quilt show before Mary-Alice is attacked again . . . with far worse results. If you would like to read the first chapter of A Stitch in Crime, go HERE. 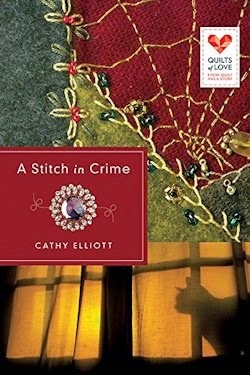 Cathy Elliott is a full-time writer who lives in northern California and whose cozy mysteries reflect her personal interests from playing her fiddle with friends to antique collecting and quilting. Besides collecting (too much) cool fabric, she also enjoys hunting for antiques and is several years into recovery from her eBay addiction. UPDATE: She backslid a while back, enticed to bid on a 1945 Singer Featherweight. (She won.) But now she’s back on the wagon. Except for the recent crazy quilt pillow purchase. She also leads music at church and enjoys time with her grandchildren. This is Book Four in the Windy City Neighbors series. Greg Singer coordinates consumer sports shows for powerboats, four wheelers, snowmobiles, and jet skis---macho toys for outdoor men like himself. But the job puts tremendous stress on his marriage with Nicole, who for the first time notices the handsome lawyer at the end of the block. When the recession hits Greg's industry, he thinks the crisis is merely an opportunity for God to bless him with unmatched prosperity, a promise he hears preached each Sunday, and he steps out in bold faith . . . But is he being "pound foolish"? 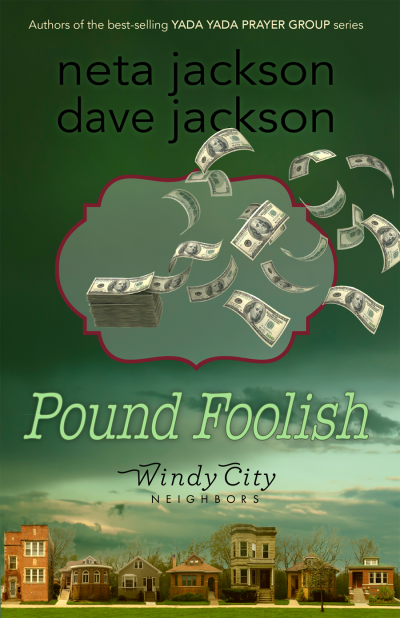 The fourth in the Windy City Neighbors series, Pound Foolish explores the economic upheaval and uncertainties challenging every family. Intersecting with Penny Wise (book three), the Jacksons employ the innovating storytelling technique of "parallel novels." Though each book follows its own drama and story arc, the characters' lives become intertwined and affect one another. Pound Foolish returns us to Beecham Street---a typical American neighborhood . . . where a growing friendship brings new meaning to prosperity. As mentioned, this is the fourth book in the series so really should be read as such. It took me a long time to get around to reading this one, partly because of the holidays, but partly because as Greg Singer was introduced in the last book I just didn't like him and wasn't sure I wanted to read his story. In some ways that feeling persisted through most of this book. He is consumed with himself and financial success to the exclusion of all the people around him that I couldn't really empathize with him, a major point for me to get into any novel. That being said, this was probably my least favorite of the series, but it was in some ways redeemed and I did appreciate some of the themes and messages in the book. Read other reviews or purchase your own copy here. 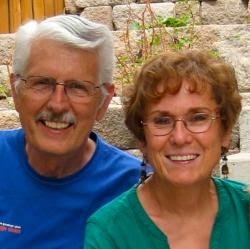 Dave and Neta Jackson are award-winning authors living in the Chicago area where their parallel novels from the Yada Yada House of Hope and Harry Bentley series are set. As a husband/wife writing team, Dave and Neta Jackson are enthusiastic about books, kids, walking with God, gospel music, and each other! Together they are the authors or coauthors of over 100 books. I'm pretty sure this is my absolute favorite photo from Christmas this year. Although I'm just now getting a chance to really go through them. 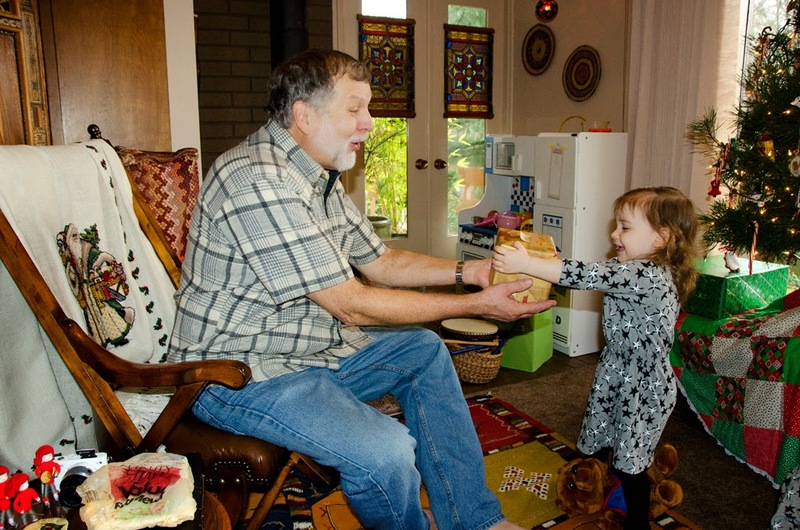 Hope and Grandpa. Miriam paints the future…but can she change it? Miriam watches the people jostle their way below the windows of her warehouse home, never thinking to look up at her as she paints their faces. But Miriam's gift as an artist goes beyond a mere recording of what is: Miriam paints their futures. Only once was she wrong. One woman doesn't match the future Miriam saw. The bright girl was supposed to grow into a respected businesswoman. Instead, Ione disappears nightly into the shadowed alley next to the cathedral with the other prostitutes. Then one night, while walking through the city fog, Miriam finds Ione broken and beaten. Miriam is forced to open her home to the stranger whose face she knows so well and open her life to change she never could have foretold. Women are missing—some found floating in the river, some never seen again. The deacon from the cathedral is the first to help. Soon Miriam’s solicitor, Michael, aids her in rejoining society so they might uncover the evil at work in the corrupt city...and awakens feelings she had never considered before. Finally engaged with the world she has so long observed, finally stirred by love and friendship, Miriam realizes the responsibility of her gifting. No longer can she just paint what will be. She must now help Ione find the future she is meant to have...and find her own along with it. 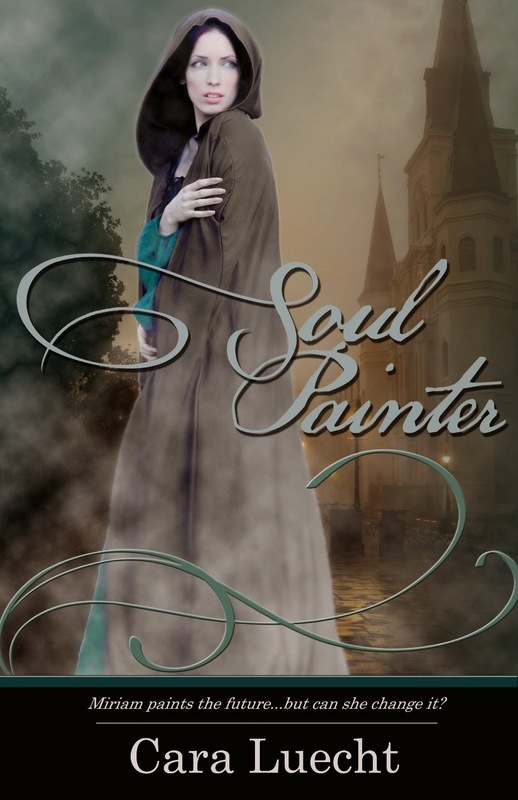 If you would like to read the first chapter of Soul Painter, go HERE. ETA: February 2016. Wow, I'm not even sure where to start to describe this book. The cover painting is dark, and this book is dark in some ways too. It's certainly a story that will stick with me for a long time. I think Ms. Luecht is a masterful story teller and very much drew me in to her narrative. That being said, this is not a story for everyone. I wish there was some way to put a warning without giving away too much. I do have the second book in the series and I plan to read it in the near future because I want to find out more about what happens to these characters. I guess the best way to put it is that unfortunately there is a lot of darkness in our world and this story feels almost a bit too true to life. That it could happen is scary. (and not usually my preferred type of story to read since reading is an escape for me) However, the story is not without hope as well, which is the redeeming feature. As I said, masterfully written. I never planned to be a writer. In fact, it took me a while to finish college. But I did, and here I am. And I now I can’t imagine not being a writer. 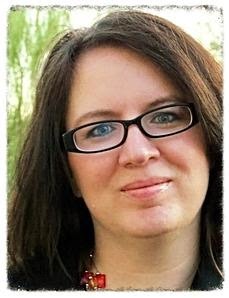 By day, I am an English Instructor at MATC, Marketing Manager for Degnan Design Builders, Inc., mother to four amazing children, wife to an eternally patient and supportive husband, and Worship Leader for Living Hope Fellowship in Sun Prairie, WI. In the evening, when I can squirrel away some quiet time, I read and write historical fiction. I have a B.A. in English Lit. from UW Whitewater and an M.F.A in Creative Writing from Fairleigh Dickinson University in Madison, NJ. If you have a question for me, or if you are local and would like me to stop by your book club or writer’s group, please drop me a line via the “Ask the Author” tab. I always love the opportunity to meet with others who share my love of books. 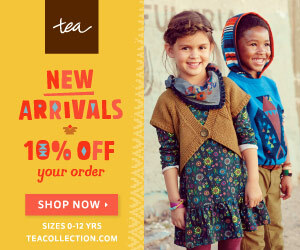 Tea Collection End of Season Super Sale! *This post contains affiliate links and I will be compensated a small amount if you make a purchase after clicking on one of my links. If you've been wondering about Tea Collection and debating checking them out for yourself now is the best time to stock up! Get the last piece or two you need for this winter or buy at rock bottom prices for next season. This is it, the very last sale for the Germany destination. Prices are marked down and then the sale is 40% off on top of that! Use code TAKE40 when you checkout. I love people. I'm mostly in the middle between extrovert and introvert, but I swing slightly more introverted. But I really do love people, especially getting to know someone. And once I know you, watch out, you'll get Christmas cards from me forever! So this week I was thinking about how, while I love my small house, I wish it was slightly bigger so it would be easier to have people over. We gather at a friend's house for football games and his house easily hosts upwards of 20 people. It's fun. Even at that, I can have a family over and we can be crowded. Then there's the scheduling issue. 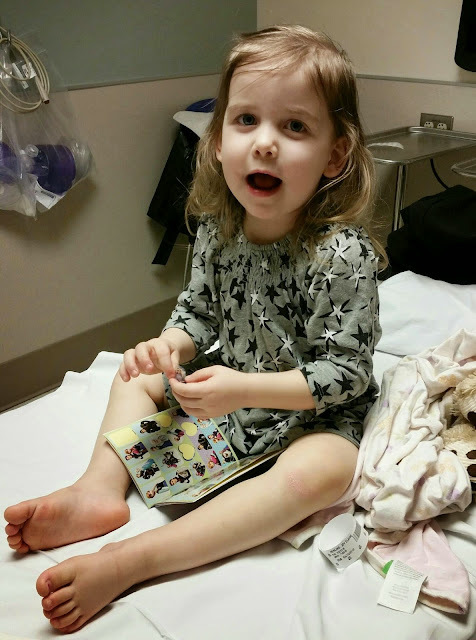 Finding a time that works for both me and my friend(s) can be complicated, especially with kids getting sick in the winter. But really, this week I was thinking of posting on Facebook, first one to respond, come have dinner at my house Sunday night. I remember when I was a kid after church on Sunday we'd run around to all our friends seeing who was free to come over for lunch. It was the best. We've never done that now, it always has to be planned in advance. We know what people are up to every day with Facebook, Twitter, Instagram and still sometimes email, but there's something about having the chance to be in the same space that makes it real. And that's super complicated for those of us with small children right now because you can actually have a better conversation online without the every.30.seconds.distraction of the kids needing something. It's just not quite the same though. So, another small goal for this year. Attempt to connect with more people in real life. And if you're reading this, you're welcome! 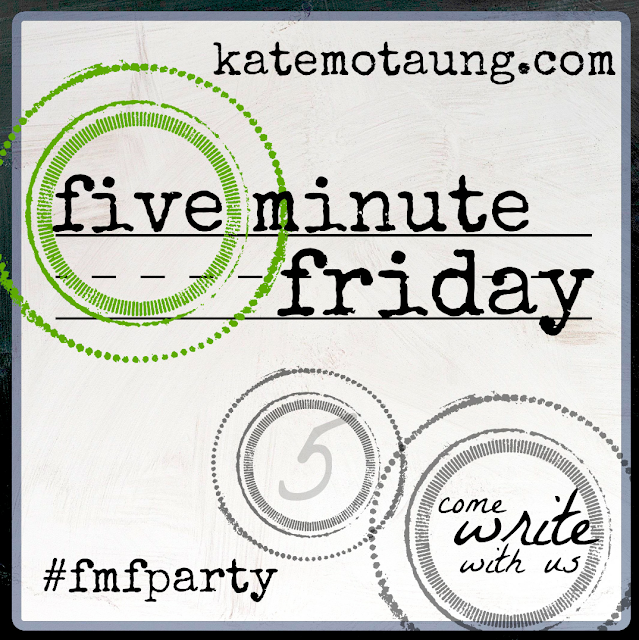 Five minute Friday is now hosted over at Kate's place. As always please join in or leave a comment! From our third (and final) Christmas gathering this past weekend. 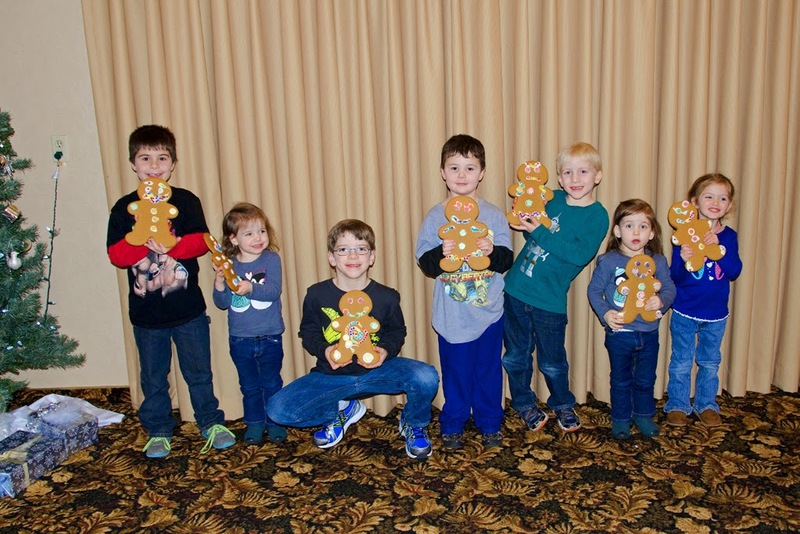 One of my cousins brought fun gingerbread kids for all the kids to make one. They lasted long enough for me to take a group picture and then they all got eaten. "None" kids were sleeping early that night! 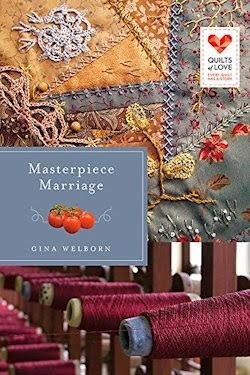 If you would like to read the first chapter of Masterpiece Marriage, go HERE. After Gina Welborn earned a Communications degree from an Oklahoma university, she thought the perfect career choice was working at a news radio station writing commercial copy, public service announcements, and news reports. A PSA writer, sadly, can only be so creative when describing ketchup and Geronimo’s grave. (No, she never combined those two elements in the same script, but now that she thinks about it, she wishes ... ) Thus Gina "retired" to focus on goal, motivation, and conflict within her family before discovering her niche in writing romances. 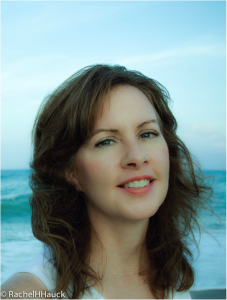 A member of RWA and ACFW, Gina has four published novellas, including one in the ECPA-bestselling Mistletoe Memories, and three short historical romances: The Heiress's Courtship, The Marshal's Pursuit, and Masterpiece Marriage. A moderately obsessive fan of Community, Once Upon a Time, and Chopped, Gina lives in Oklahoma with her pastor husband, their five Okie-Hokie children, a box-lab, two rabbits, four guinea pigs, and a fancy Russian dwarf hamster named Tom Bob Deucalion. Gina is represented by the Steve Laube Agency. I wrote this Sunday afternoon and I've been thinking about it all week. I didn't necessarily intend to have a "word" for the year, but you'll see why I'm choosing Hope this year as you keep reading. I'm not sure I could tell you what the sermon was really about this morning (Changing Seasons), partly because I had Hope sitting on my lap, partly because I was just distracted. But one little thing caught my attention. At some point the pastor said that those who commit suicide have given up hope that anything will ever change. And it's truly sad because things are always changing and there is always hope that it can get better. I'm not sure this was what he intended for anyone to get out of his message, or maybe it was, but I got it. I needed that message. This past year has been incredibly hard for me in almost every way. I have given up a lot of hope. I have hoped for things for years and not seemed to be able to see anything different. This year it all seemed to come down on me. One other thing today, an email message from a blogger collective that spoke about how waiting is never pointless. In the waiting, even if you can't see it, things are changing and moving, hopefully that you will be able to see when looking back, but maybe that we will never see this side of eternity. So this year I'm going to take Hope. 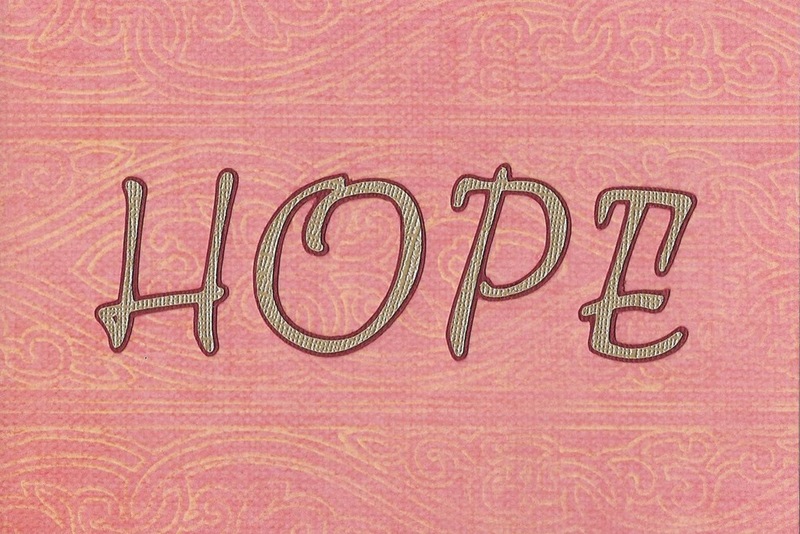 Hope as a verb rather than a noun. As an action of believing rather than something to passively receive. I will have hope. I also find it highly ironic that Hope was sitting in my lap through all of this. She doesn't normally go to church with us, but today did not want to stay in the nursery and she's actually pretty good about sitting quietly with me. The graphic above I created with my scrapbooking supplies. The letters aren't straight and it's bugging me a little bit, but by the time I realized it the glue was good and stuck. Maybe that's okay. It's not perfect and maybe hope isn't perfect either. Goodness knows I certainly am not! I plan to put this in a visible spot for me and maybe that will be just one more little reminder that even when things don't turn out right, at all, that there is still Hope.